In-depth reporting and analysis from a global perspective. Was the suspected suicide attack a 'payback' for Russia's involvement in Syria? We have the latest on the investigation and we ask whether the suspected suicide attack was a 'payback' for Russia's involvement in Syria. The Egyptian president gets a warm welcome in the White House - we examine what lies behind the rapprochement between Cairo and Washington. We hear about efforts to find survivors and to help those who've lost their homes in a mudslide in the Colombian town of Mocoa. And we report from Finland on an experiment with giving a random group of people a fixed sum of money. 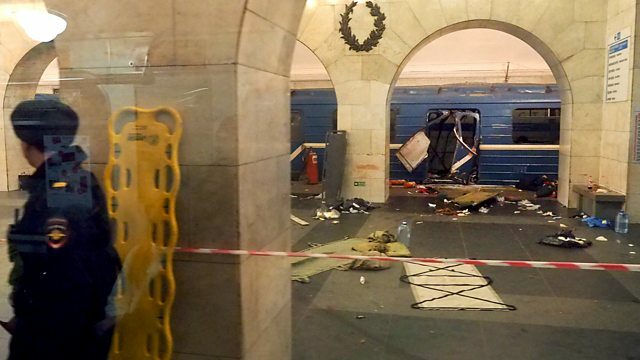 (Picture: Damaged train carriage in St Petersburg Credit: AFP/Getty Images).